On the 26th of April the second round for elections was held on the occupied part of Cyprus for the presidency of the self-declared ‘Turkish Republic of Northern Cyprus’. 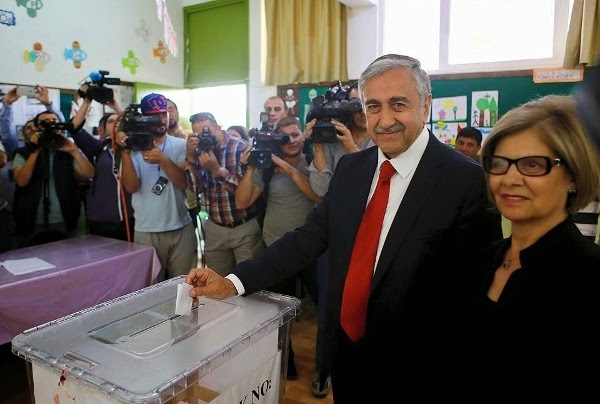 The veteran politician and architect from “Tessera Fanaria” in Limassol, Mustafa Akinci was elected as the leader of Turkish Cypriots standing as an independent and winning 60,3 percent of the votes (177000 registered voters). Campaigning on a platform of peace and handing away olive branches as the manifestation of peace and genuine Cypriot identity, the leftist moderate has pledged to focus his energy in the quest for a viable solution to the long-lasting Cyprus problem. Cyprus has been divided since 1974, when a coup d’ etat orchestrated by the military junta of Greece was used as a pretext by Turkey to invade the island, causing a humanitarian catastrophe and establishing a geographical and ethnical division. Akinci is in favor of the island’s reunification as a federation, unlike his opposing candidate in the second round of elections, Eroglu, who supported a looser form of partnership between two ethnically divided states. His election was met with high hopes on the southern part of the island, even at the highest level, since the President of the Republic of Cyprus was quick to characterize the election of Akinci via twitter as a “hopeful development for our common homeland”. Two days afterwards the President of the RoC announced ‘confidence building measures’ aiming at improving the climate of trust and instill hope between the two sides. Akinci has also expressed his willingness to discuss confidence building measures in tandem with peace negotiations. To that end, during his pre-election campaign Akinci advocated for the return of the military fenced suburb of the eastern coastal town of Famagusta, Varosha, in exchange of the opening of the port of Famagusta and the airport in Tymbou for international flights. The return of the city was first put forward by UN Resolution 550 in 1984, which stated that the UN: “Considers attempts to settle any part of Varosha by people other than its inhabitants as inadmissible and calls for the transfer of this area to the administration of the United Nations”. Whether this will take place any time soon it remains to be seen together with the election of Akinci as a ‘window of opportunity’. What is certain though is that there is a great momentum, even after Akinci’s visit to Ankara, and it depends on the two leaders’ willingness for resolute action, as well as Turkey’s purported commitment towards finding a solution, to grasp this opportunity and promote the virtues of a contract of trust, thus ending the de facto partition of the island. Turning back to the title, in cue sports, such as pool, momentum is transferred when one ball hits another and is stopped. Learning to predict the angles, though, is essential to the game. *Nicholas Mouttotos is a Ph.D. Candidate at the Faculty of Law of Maastricht University. His research focuses on the effects of Europeanization upon the mixed legal system of Cyprus. Follow him on Twitter.